This easy Enchilada Skillet is a 20 minute meal with only 6 WW Freestyle Points per serving! It’s a foolproof recipe that’s full of flavor. Guys, I have the perfect dinner recipe for you! 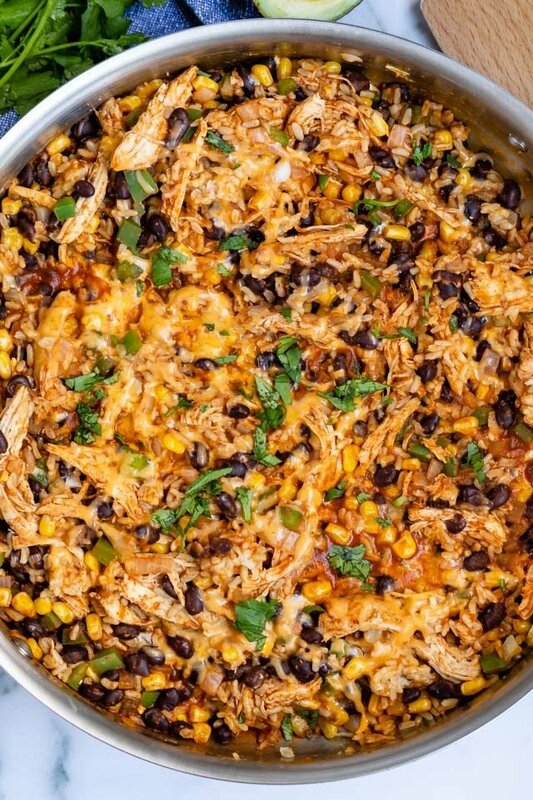 It’s this easy Enchilada Skillet and it’s done in under 20 minutes, seriously!! After a week of being sick I’m finally feeling a little more normal and ready to cook again, so yesterday I made a big batch of my Instant Pot Shredded Chicken. I have a few more dinners I’m going to make this week and I plan to make another batch of Fried Rice for lunch. This whole meal prep thing is awesome for making quick weeknight meals, which is what I need to keep me on track. At the end of a long day of working, cooking, baking and driving carpool, the last thing I want to do is slave over a hot stove for an hour to make dinner. By 5:00 I’m ready to kick my feet up and watch a Housewives episode, not cook more food. That’s why 20 minute meals and meal prep are such a perfect thing for me, and I assume for you too. If you’re a busy person you need to add this easy skillet recipe to your dinner rotation. 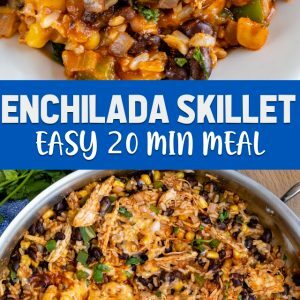 Enchilada Skillet is an easy foolproof recipe that only takes 20 minutes to make if you’ve meal prepped! And, really, even if you haven’t done meal prep it’s only a 30 minute meal! One pan and minimal dishes is how I like to cook dinner. One skillet meals are the perfect way to accomplish that goal! But wait – there’s more good news about this recipe. There are only 6 WW Freestyle Points per serving in this easy skillet dinner! That’s right: a hearty serving of Mexican food and it’s healthier and fast. It’s like a miracle! 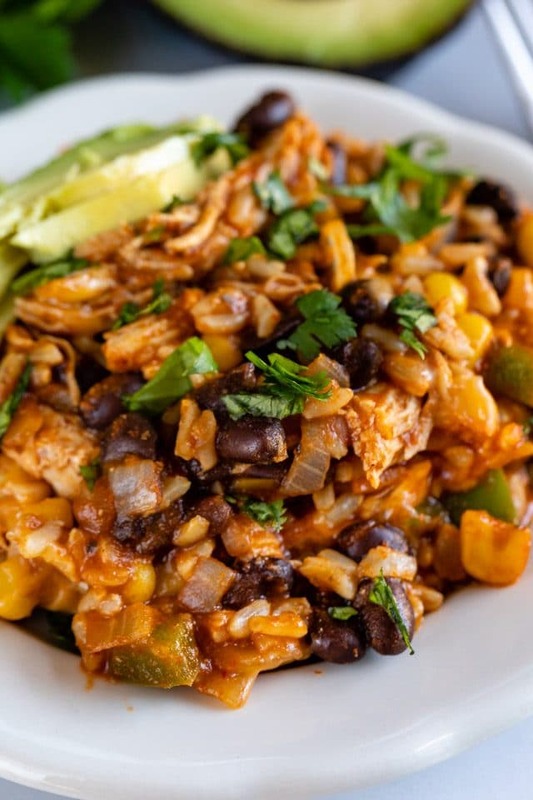 What’s in this Chicken Enchilada Skillet? With just a few ingredients dinner will be on the table. This recipe starts with my Instant Pot Shredded Chicken (you could also use leftover chicken or rotisserie chicken). Add some beans, corn, onions, and bell pepper to the chicken along with some leftover Instant Pot Brown Rice. Then toss it all with enchilada sauce and cheese until it’s hot and bubbly! I love making enchiladas but this recipe is faster and less involved. Or, if you’re watching carbs, make this a Keto version of Chicken Enchilada Skillet by omitting the rice and serving it over vegetables. If you aren’t starting with cooked chicken you can most definitely do this from raw. Slice the chicken into bite sized pieces and cook it over medium-high heat until browned on all sides and cooked through. Remove it from the pan and continue as written. Don’t have already made rice? Make some minute rice or use one of those packets you microwave. Use any color bell pepper you prefer. You can substitute pinto beans for the black beans. Don’t have frozen corn? I always keep some on hand but you can use a drained can of corn if you prefer. Use any enchilada sauce you like – mild or spicy! For the WW points to be accurate at 6 per serving, use fat-free cheese. This would also be good served without the rice; simply use it as a taco or burrito filling! Make this Enchilada Skillet recipe for dinner - it's an easy 20 minute meal with only 6 Weight Watchers freestyle points! Add oil to a large skillet and heat to medium high. Add onion and bell pepper and cook until translucent, about 3-5 minutes, stirring often. Add the beans, corn, rice, and chicken. Cook 2 minutes, then add the enchilada sauce and cook until heated through and bubbly. Add the cheese and cover, cook until cheese is melted. For WW recipes, use fat-free cheese for points shown. 6 WW Freestyle points per serving (4 servings total). Fabulous…this is perfect and fast making dinner for me..i will definitely try this…thanks for sharing…keep shared your new amazing recipes…!